Instead of running new Ethernet cables to connect your devices to your home network then why not use your existing electrical power cables? That is the idea behind Powerline or Homeplug networks. Note: HomePlug is the family name for power line specifications for networking over existing home electrical wiring. 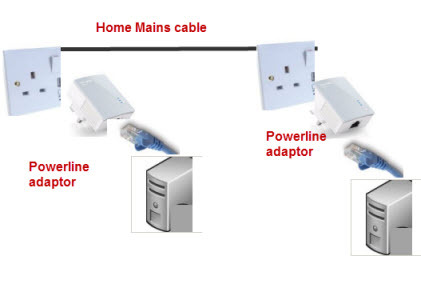 HomePlug adapters are typically used to connect non Wi-Fi equipped devices to a home network, and to extend the range of existing networks. You normally buy homeplug adapters in pairs, and in this case all you need to do is plug them in, and they work. However replacing faulty devices or extending an existing powerline network is a different story. How It integrates into your existing home network. What tools you can use. Powerline networking utilizes your existing mains electrical cable to connect devices together. Devices like computers plug into a powerline adapter using an Ethernet cable with a UTP connector, just like they would plug into an Ethernet hub or switch. The power line adapter then plugs into the mains, and uses the mains wiring to transmit the data. Another power line adapter is required somewhere on the same mains cable system to extract the signal. Long range and not affected by thick walls and other obstacles like Wi-Fi. To connect devices to a home network that are out of range of the wireless router. 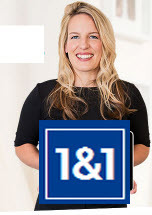 To connect a device to the network that requires a high speed and reliable connection e.g. games consoles. To provide wireless range extension using a powerline Wi-Fi booster. Powerline standards have evolved since the initial homeplug 1.0. It is important to be aware of the different standards because of potential inter operability issues. Homeplug AV speeds 200Mbs speeds of 500Mbps are now available and marketed normally as AV500. HomePlug Green PHY -low power version and low speed. See Wiki- for more detail. You will probably face inter operability issues when you need to add another adapter to an existing network or replace a faulty adapter. Generally homeplug 1.0 devices will only work with other homeplug 1.0 devices, and Homeplug AV,AV2 and HomePlug Green PHY will all work together, but will not work with Homeplug 1.0 devices. Homeplug 1.0 works with HomePlug 1.0 Turbo (85 Mbps). HomePlug AV can coexist on same cable with Homeplug 1.0 adapters, but will not work with homeplug 1.0. HomePlug AV 200 works with homeplug AV 500M but at the lower speed. AV,AV2 and HomePlug Green PHY are fully interoperable but at the speed of the lowest speed adapter. Having a basic understanding of how the powerline network works is crucial to troubleshooting problems, and for building,repairing and upgrading them. Powerline adapters share the same physical media (the mains cable). This means that in a neighbourhood of houses that all use powerline adapters there is a potential security risk. 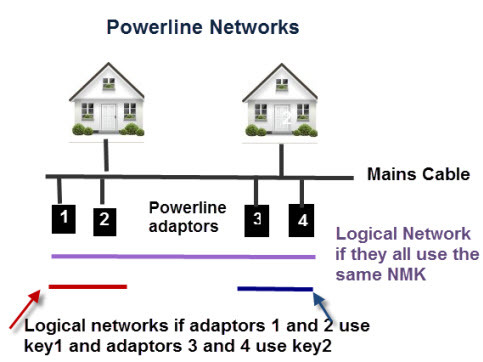 To overcome this powerline adapters form logical networks based on a security key or password called a NMK (Network Management Key). This key is used to encrypt the data on the network using 128 bit AES (AV2 standard) or 56 bit DES (AV1 standard). To build a powerline network you need at least two homeplug adapters. Normally you buy adapters in pairs, and the manufacturer will normally ship each pair with a common NMK. This means that when you plug them into your mains socket they will establish a connection between themselves, and form a logical network. If they don’t automatically establish a connection then you will need to intervene and manually initiate pairing. The basic idea is that you put one of the adapters in a receptive mode where it listens for another adapter trying to establish a connection. You then do the same with the other adapter. The two adapters should locate each other and agree a shared key. Note: the adapters will remember this key even if they are unplugged from the mains. Note: On Older adapters (AV1) don’t have a share/security button to initiate the paring process you may need to program each adapter with the same key using the software utility that comes with the adapter. Some manufactures will ship adapters with a common NMK. This means that adding adapters to an existing network is easy as the new adapters have the same NMK as the ones already on the network. However this is a security risk and you should change the NMK from the default. Creating a new powerline network. Adding new adapters to an existing powerline network. This assumes that you have purchased the adapters as a pair. In which case just plug them into the mains socket preferably close to each other and they should pair. Once paired you can move them to the required location. If they don’t pair then use the pairing procedure below, but you may also want to consult the documentation that came with the adapters. Within one minute Press the security or NMK button on adapter B for less than 3 seconds and the power LED should flash. Both power LEDs should stop flashing and stay illuminated for a successful connection. If pairing is unsuccessful then see troubleshooting section. If one of you adapters goes faulty then you can replace it. However you should be aware of the following. Homeplug 1.0 works with HomePlug 1.0 Turbo (85 Mbps) but not with Homeplug AV1 or AV2 adapters. Therefore if you have the older adaptors then consider replacing both adapters with new ones. If you Have Homeplug AV1 adapters then try to replace the broken one with one of the same speed, and from the same manufacturer when possible. However it is not crucial as devices from different manufactures should work together. A Homeplug AV1 200Mbps adapter paired with a Homeplug AV1 500Mbps adapter will run at the lower speed. To pair the new adapter to the existing one use the same pairing procedure as covered above, If pairing is unsuccessful then see troubleshooting section. Adapters must be added one at a time and the pairing process carried out each time. Pair adapter C with either Adapter A or B but not both. Pair adapter D with either Adapter A or B or C.
To remove an adapter from an existing network then press the security/NMK button for 10 seconds while still plugged it. The adapter will generate a new random password which places it outside the existing logical network. If they don’t pair you can try resetting both devices by pressing the security/NMK button for 10 seconds and then try again. You can also use the the utility that came with your adapters to set the key on the adapters. See using the Powerline utility. You should receive a DVD with your adapter containing software that you can use to mange your powerline adapters. To manage individual adapters the best way is to plug the Ethernet cable from your computer into the powerline adapter. Therefore you should ideally install the software on a Laptop. You can remotely manage adapters, but to do that you will need to know the password of the adapter. Each adapter has its own individual password. Note this is not the same as the NMK. 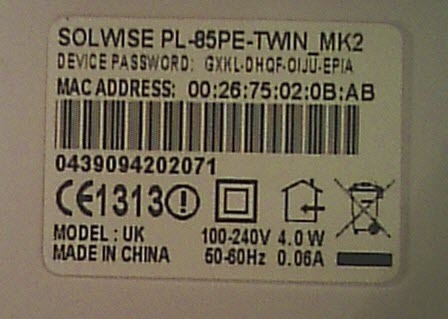 This password is hard coded into the adapter and is used to manage the adapter. 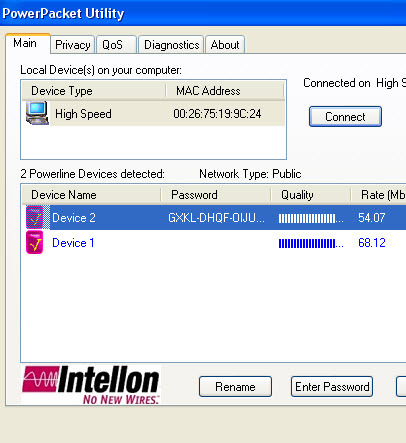 Here is a screen shot of my network showing two adapters.I have entered the management password for one of the adapters but not for the second. This means that currently I can only make changes to the one with the password set. To set a password for the encryption most utilities have a security option but mine uses the privacy tab, and is accomplished by giving it a network name (homeplug by default). 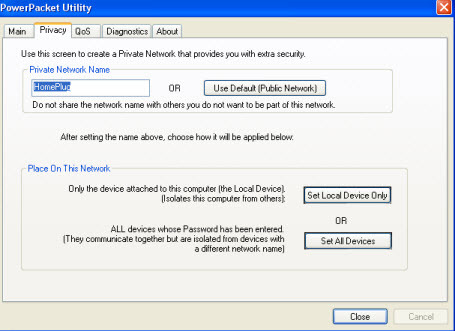 The network name needs to be applied to all adapters on the network which can only be accomplished if you have entered the password of each adapter into the management software. So you can move from one adapter to the other with your laptop and set each one individually. Powerline/Homeplug networks are very good way of extending your home network without running cables, and for connecting devices that need a fast and reliable connection. Can you clarify how routing works in the following scenario? I currently have 4 homeplugs but want to increase Internet speed by putting in an ethernet cable around the house from the router to a new ethernet switch that will also be connected to a homeplug. This will give me 2 homeplugs connected directly to the router. Does the homeplug programming determine which is quickest route to the router? Specifically l want the traffic from me homeplug in my office to pick up the route to my router via the homeplug that is connected to the new switch that I am putting in that is itself directly connected to my router via the new cable around the outside of my house as opposed to following the path which makes greater use of my mains circuit which will be slower. Visa versa applies as well from my router to my office. Homeplug adapters don’t do routing. When you connect homeplug adapters together they can be considered as effectively connected by a single Ethernet cable. You cannot prioritise the traffic between them. Homplug adapters need a partner i.e they need to be paired this forms a logical connection and the data link level between them. If you join into this connection with other homeplugs they all then share the same logical connection. However you could pair two homeplugs (1 and 2) and then pair the other two homeplugs (3 and 4) and this would give you two logical connections. In this configuration a deive connected to homeplug 3 or 4 could not communicate with a device connected to homeplug 1 or 2. To make it possible you would need to connect one of the homeplugs in each pair to a switch. I wasn’t aware that I could create 2 separate networks with 4 Homeplugs. So if they are all on the same logical network how do I switch 2 of them to a separate network? Do I just press and hold the network join button on one of the plugs and then press the button on the other plug that will be connected to the new switch? According to my TP-link instructions press the pair button for 8 seconds to leave an existing network and 15 seconds to reset. You will need to reset one and with the other leave the network and then pair it again with the other. I would do this on a extension cable far away from the existing network as possible. However not sure what you will gain as they still share the same virtual connection as far as I understand it it is just that they are encrypted using different keys which is why they can’t exchange data. But you don’t know unless you try it. I’m think of doing something similar and buying new hardware, is there any way of avoiding this, so that the network appears as one (we have a wifi extender provided by sky which does this)?? You could look at wireless mesh networks which are designed to overcome that problem. http://www.steves-internet-guide.com/wi-fi-mesh-networks/ but again their are exceptions. I have a BT mesh network and just need to know if I can plug a power line adapter into one of the extenders , I can plug it in by the router as the house has a three different ring mains so the powrline adapters won’t be able to connect to each other.. I hope that makes sense! I assume the BT extender connects via ethernet to the router. You should be able to use the powerline adapters for the ethernet connection. I believe you will experience problems if you are on a different phase (unusal). Thanks for the reply, I have come to the conclusion it is a house wiring issue , I will probably need to get another mesh extender or two! the house is quite big, we have five different fuse boards covering 35 rooms! Just can’t get WIFI into the kitchen! Excellent web site by the way, appreciate your quick response. Glad you have found the problem I didn’t realise the size involved. You might want to look at running a cable or cables to various locations in the house.Good luck. I knew homeplugs worked best in main’s sockets and not on extension cables but BBC iplayer on my TV worked fine so I got a firestick to stream from my satellite box. Although iplayer on the firestick worked fine the streaming was terrible. Sure enough attaching them to main’s sockets cured the problem. However I do not have enough main’s sockets. Will Wall Adaptor Sockets (like a plug-in double or triple plug) work any better? Sorry but you need to try it. I have several homeplugs on short extensions and they work ok. I guess it depends on how far apart they already are and the state of the home wiring. Thank you for the article, I do have a question though, do the plug in extenders need to be on the same mains circuit or will the signal go through the fuse box allowing signal on a different ring? My ground floor mains ring is on a different fuse to upstairs. How far is the office from the house? I would suspect it is your main connection to the office. Try using a long extension cable to the office and see if you get a better connection using that and that should tell you if it is the wiring to the office. Will the homeplug work over an RCD. I’ve a garage which has it’s own RCD which is feed from my home RCD. Hi Steve. Thank you for your very helpfiul article. I am a total amateur, looking to extend my wifi in to a particular room where it currently doesn’t reach in a stone walled house. I have read lots of reviews on Amazon with the intention of buying a power line adaptor but am very confused which to buy. Do I need to check any speed or anything with my current router and should I be looking at one that says extender? Will a basic starter kit do the job or if I pay more what exactly am I paying for? Thank you for any advice you can give. A standard starter kit should be fine. however if you want to use a tablet or smart phone in the other part of the house you should use an wi-fi powerline extender like this one. You tend to pay more for the latest high speed ones which you almost certainly don’t need. Also if you want pass through adaptors they cost more. (they let you plug in other things and don’t take up the socket). Thank you for your help – I’ve just purchased and installed the device you suggested. Works a treat and it was really simple to install . Very pleased. Hi Steve, thanks for this information. Will running an AV2 network on the same powerlines as a Homeplug 1.0 Turbo network impact the speed of the network? Will the Homeplug 1.0 Turbo adapters slow down the AV2 adapters? As far as I understand it no it shouldb’t. Thanks for this Steve. I have my router connected to a powerline adaptor, and then four other adaptors spread around my thick-stone-walled house to give ethernet and wifi connections. Generally speaking it all works, but I have random drop-outs and devices struggle randomly to ‘see’ each other, for example when trying to control the TV from my phone or remotely access the family computer. Printing is also a nightmare – it sometimes works, but often you have to move your laptop near to the main router to get a connection which works. I have followed the manufacturers instructions as best I can to make sure they are all using the same key and share a network name, but am I doing something wrong, or is this all just an inherent weakness of these solutions? Is it the Wi_fi that is the main problem or the powerline adaptors? Moving the laptop nearer the router implies it is wi-fi? Do you use Wi-Fi extenders? As you have thick stone walls I assume it is an older property. If the wiring is very old then it may be causing problems with the adaptors. I’ve seen this mentioned on forums. If you suspect the adaptors then as a quick workaround I would get a very long Ethernet cable and use that is place of 2 of the adaptors and see if it resolves the problem. You can do it to each of the adaptors in turn until you find the link that is the problem then you may need to replace that link with a wired connection. I have a Powerline Adaptor in my room connect up to my pc. Because I also have LG DVD player that needs a Internet connect I have brough a splitter with two ethernet connects at the end fitted to one PLA. My pc got on line but no my DVD.What am I doing wrong? Thanks. I looked at those splitters myself a little while ago. It seems that they don’t give you two outputs but one and you can choose which output is live. It is effectively one or the other not both. You need to get a small switch. The smallest is 4 port. Steve, thank you for a very informative article. It has helped me understand Powerline networking in our home setting. In particular, how the adapters connect by way of NMK. Thank you. If you would like to use your HomePlug to “move” your router, is that possible? I’ve never done this but provided that the router connects to the CPE using Ethernet then I would say yes. However you have 4 homeplugs and they should be configured in pairs as two networks not as a single network. The homeplugs between the router and CPE one network and the homeplugs between the router and WAP the second network. Will a brand specific configuration utility work with multi-brand AV2 networks? I don’t think so,but if you find out different I would be interested in knowing the detail. In fact, the Logitech Powerline Utility (http://powerline-network-utilities.software.informer.com/) can map other brands’ Powerline AV adapters (identifying them by their MAC numbers) and monitor transfer speed among them. I have not yet tried to establish security among them using the utility. Tks for that let me know how you get on with configuring them. Very usefull article, thanks you. I’ve looked for one but haven’t found anything yet. There don’t seem to be any tools/utilites for powerline networking.